five × seven = Required Please enter the correct value. 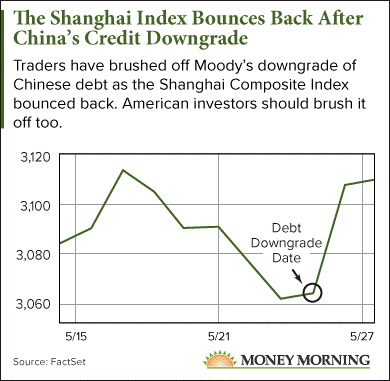 The China credit rating downgrade by Moody's Investors Service last week (May 24) has been viewed by some as a signal that China's economy is slowing down. Money Morning Chief Investment Strategist Keith Fitz-Gerald says Moody's credit downgrade "makes me want to roll my eyeballs." "They missed the last [credit crisis], what makes them think they'll be right about this one?" Moody's downgraded China's credit rating from Aa to A last week, explaining that it expects China's economic growth to slow in the coming years while the government's debt grows. "The downgrade reflects Moody's expectation that China's financial strength will erode somewhat over the coming years," wrote Moody's in its statement. But there are two reasons we're not worried about China's credit rating downgrade. First, ratings agencies like Fitch, Moody's, and Standard & Poor's have been wildly inaccurate in the past. The 2008 financial crisis in the United States is a good example of how poorly credit rating agencies performed. During the run up to the crisis, agencies like Moody's often rated mortgage-backed securities made up of risky subprime loans with their top Aaa rating. High credit ratings like these played a major part in turning the subprime mortgage crisis into the full-blown financial crisis. You see, banks bought and sold these risky securities on the basis of their sterling Aaa ratings, and when these mortgages eventually foreclosed, Wall Street banks hemorrhaged money. That's what led the Financial Crisis Inquiry Commission (FCIC) to write in its 2011 report on the crisis that the three major credit rating agencies – Fitch, Moody's, and Standard & Poor's – were "essential cogs in the wheel of financial destruction" unleashed in 2008. Past failures by the credit rating agencies don't mean they'll always be wrong in the future, but we should be skeptical of their decisions. 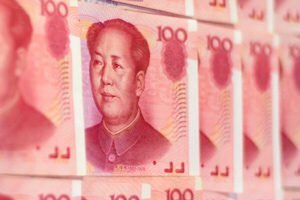 Second, China's about to undertake a massive new economic initiative that could reposition it as the world's economic leader. "China's ambitions are extraordinary and unprecedented," Fitz-Gerald said. In fact, China's ambitions are so huge Fitz-Gerald thinks they could "make you a millionaire in the next five years." That's because China is pouring $5 trillion into an economic agenda designed to remake half the world in China's image. The "One Belt, One Road" initiative will see China expand trade with up to 68 countries across Asia, Europe, and Africa. Because China will be the country supplying the cash and infrastructure to make it work, China's economy will be the major winner. The plan will open more than a third of global GDP to Chinese businesses, and will boost the economies along the new Silk Road so they can afford to purchase even more from China. This is a strategy that will ensure Chinese economic growth for years to come, and it's one big reason why Moody's forecast of slow economic growth misses the mark. The new Silk Road plan is likely why Chinese investors brushed off Moody's credit downgrade last week. But it also means American investors have little time to wait to invest in China before they are left behind. The "One Belt, One Road" initiative is already underway. Construction projects are beginning, and China just held its first forum of global leaders involved in the project. That forum sent 28 leaders to Beijing, the most since China hosted the Olympics in 2008. Fortunately, Fitz-Gerald is bringing us one of his top China stock picks to take advantage of the coming Chinese economic boom.